Some Records Just Demand to Be Shared Immediately! 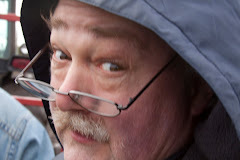 First, I want to thank stalwart reader and frequent offer of comments Sammy Reed, who made sure to alert me to a sale for a well known song-poem earlier today. I actually saw it before I saw his note, and gobbled it up, but I am much appreciative. Speaking of Sammy, he has moved his "Music from the World of the Strange and Bizarre" to a new address. I have changed the link (to the right and down a bit). There's not much there yet, but I'm sure it will be rockin' and rollin' soon. And speaking thereof, WE HAVE A WINNER!!! This is my favorite new-to-me record that I've heard in I-Don't-Know-How-Long - at least six months, maybe more than nine. And I'm not surprised at all. 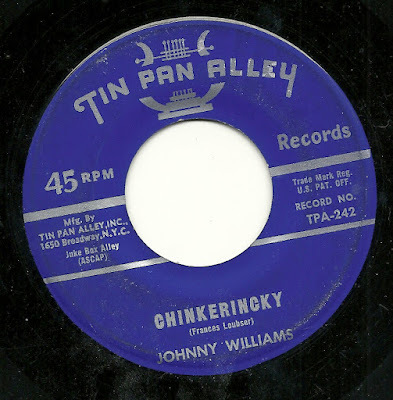 When I saw Johnny Williams' name on the auction for this record, I knew I had to go all out to get it, as the only other Johnny Williams song-poem I've ever heard is one of my favorites of all time, "Somebody Fiddle, I'm Burning" / "Darling, I'm So Blue", which you can hear here. Today's record is equally ridiculous, in an entirely different way, but it has the added feature of having some truly wonderful lyrics, a truly lovely, if offbeat, set of words celebrating being the parent of a young child - 3 years old, from what is said in those lyrics. The child is nicknamed "Chinkerincky" by the parent, and that is the name of the song. The setting, as you'll hear, is quite idiosyncratic, and pretty out-there for a 1960 song poem (that's the year the lyric was copyrighted). I have to wonder if the song-poet approved of the percussion heavy arrangement, but it sure works for me. And the lyrics are nothing short of adorable. They make me very nostalgic for the days when my girls were that age. This is a wonderful record. 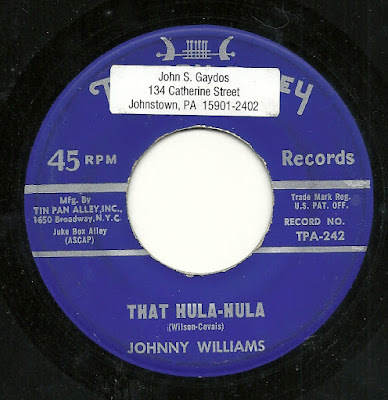 On the flip side, we have the evidence that was quite clear from Johnny Williams' three upbeat songs - he wasn't really much of a singer. While his enthusiasm got him through the three songs I've mentioned so far, "That Hula-Hula", required style and finesse, neither of which appear to have been in his wheelhouse. It's not much of a song, either, and by the end of the record, the guitars are noticeably - ridiculously - out of tune with each other. 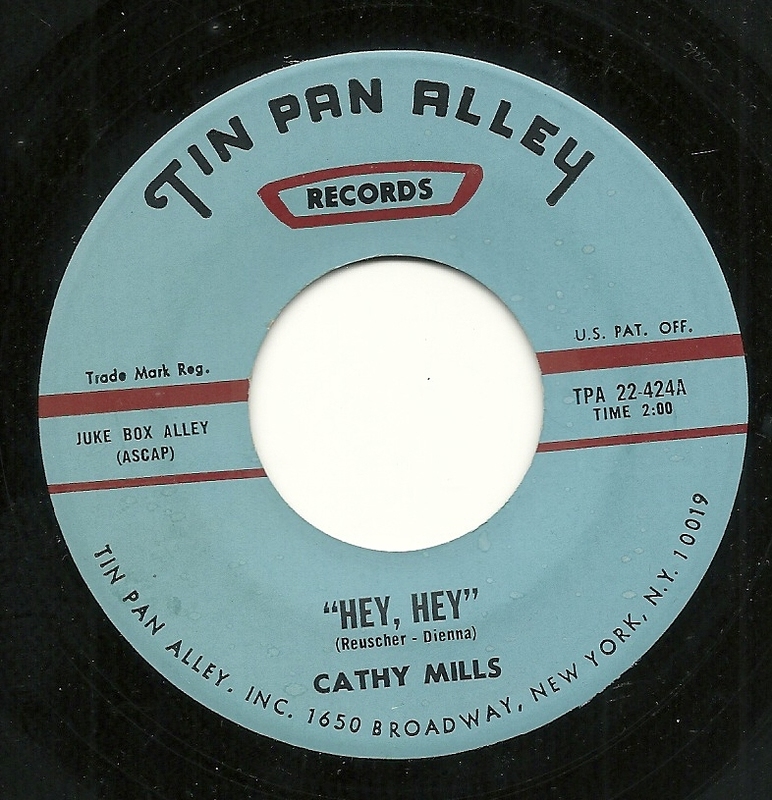 Ah, well, rare indeed is the song-poem record containing two winners. "Okay, That Was Good - Now, Once More, Just a Bit More Obnoxiously"
So I just heard this record for the first time this week, and even though it's a Christmas song-poem, I didn't want to wait ten months to share it with you. 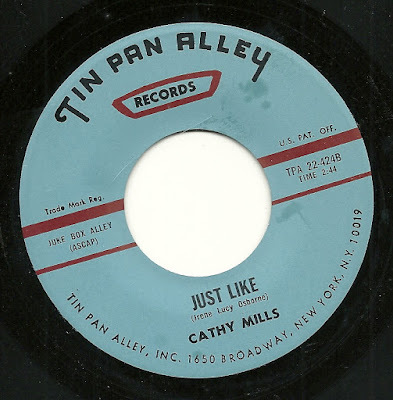 It's our old friend Cathy Mills, occasional star of the Tin Pan Alley label, doing (what was apparently) her best to sound cutesy. Perhaps the results are exactly what the song-poet was looking for. I certainly hope so, but what I hear is an entire performing ensemble being as cloying and obnoxious as I would think was possible. It's certainly not impossible that this was on purpose - I've heard enough song-poems to know that sometimes the musicians had a bit of mean-spirited fun with the material. Whatever its backstory, I find "Just Like" to be sort of wonderfully awful. See what you think. One listen to Cathy Mills' flip side, "Hey, Hey" makes clear that her real singing voice sounds nothing like the kiddie voice on "Just Like". Here we have a tribute to the various instruments that make up a combo who are playing a rockin' number. And all is fine with that - there's a trumpet, a sax, a mellow organ. Cool. But then, in a phrase I'm not sure has ever been uttered or written, outside of this song, "Don't forget the bass cello groan". Yep. That old groaning "bass cello". This week, it was my great pleasure to receive an e-mail from perhaps the highest profile correspondent that I've ever heard from, throughout my blogging career. More about that, perhaps, later, but the subject of the e-mail was his love and particular fascination with Rodd Keith's work with the Chamberlin, at Film City records. 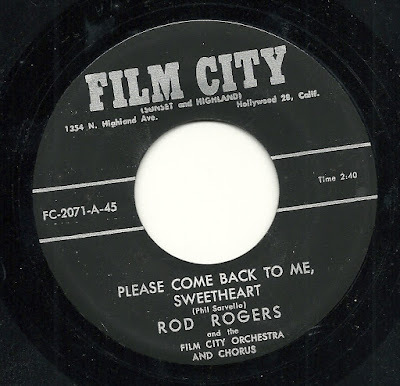 And so, even though i just recently featured another of Rodd's records from this period, I thought I'd share another one, in response to that writer, his e-mail, and our upcoming phone conversation. What's more, this record has what may be one of the quintessential titles for a song-poem record - a phrase which captures a frequent thing thought or said about a relationship or an incident, and which is behind a good number of song-poems, yet rarely actually chosen as a title, partly because those phrases are not particularly musical or poetic. My pal Stu's favorite in this "quintessential title" category is "You Insulted Me", as sung by Sammy Marshall (under the name "Ben Tate"). So here's another one. 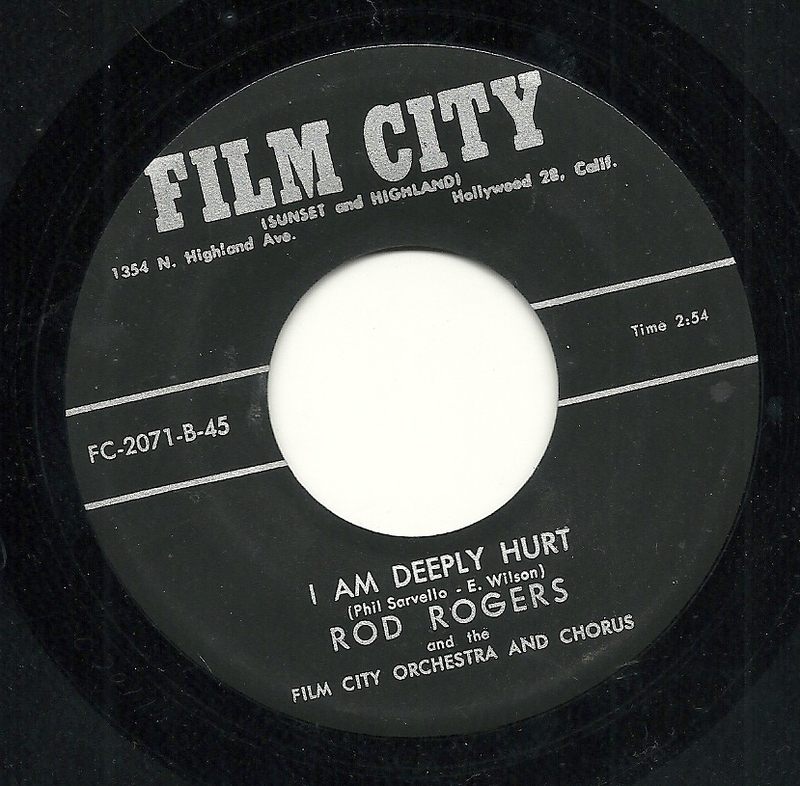 As sung by Rodd Keith (as always for Film City, under the name "Rod Rogers", with his one man band Chamberlin act represented here as "The Film City Orchestra and Chorus", with "I Am Deeply Hurt". It's a shuffle of a beat, with Rodd singing in a supper-club baritone, a pleasant enough diversion, if nowhere near what he was capable, until the truly fabulous last note, which is worth the price of admission. And speaking of clunky song-titles, on the flip side, we encounter "Please Come Back to Me, Sweetheart", a pretty darn bland number. It's a competent performance, but one with few, if any, of the minor charms of "Deeply Hurt", at least to these ears.